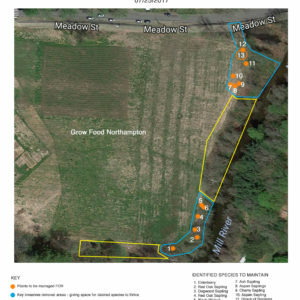 Productive Conservation rethinks floodplain agriculture and establishes a management model for ag lands in the Connecticut River Valley. 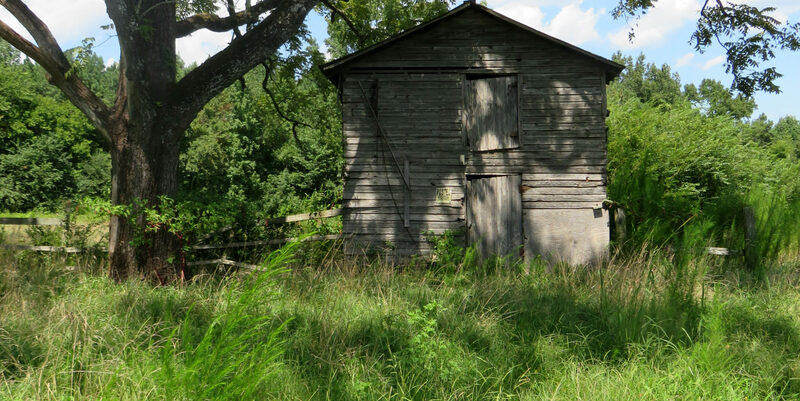 Productive Conservation is an approach to land management that builds ecological integrity while providing for human needs. 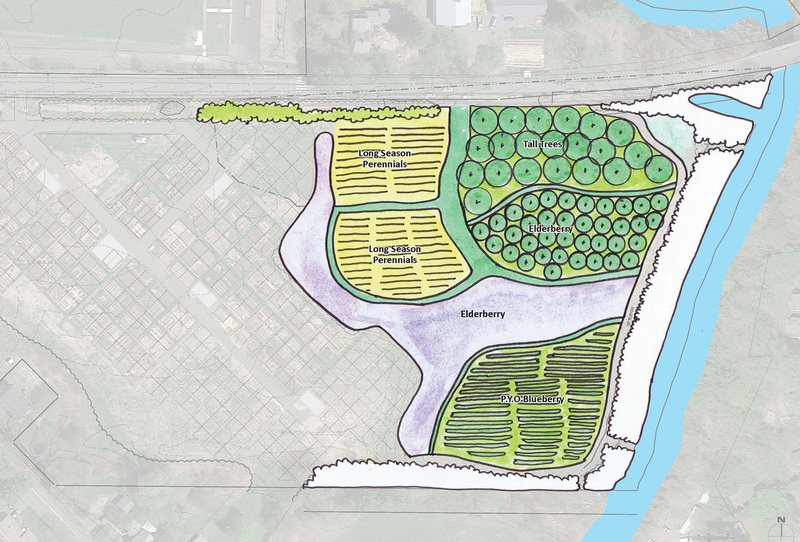 It aims to mimic the layered growth and ecosystem services of a floodplain forest, while producing marketable crops. 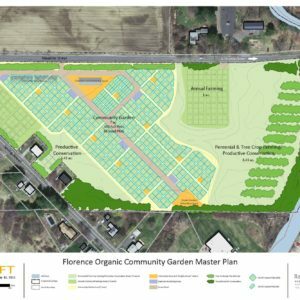 Along the Mill River in Florence, MA, on the Grow Food Northampton (GFN) farm site, a vision for a robust Productive Conservation model is taking shape. 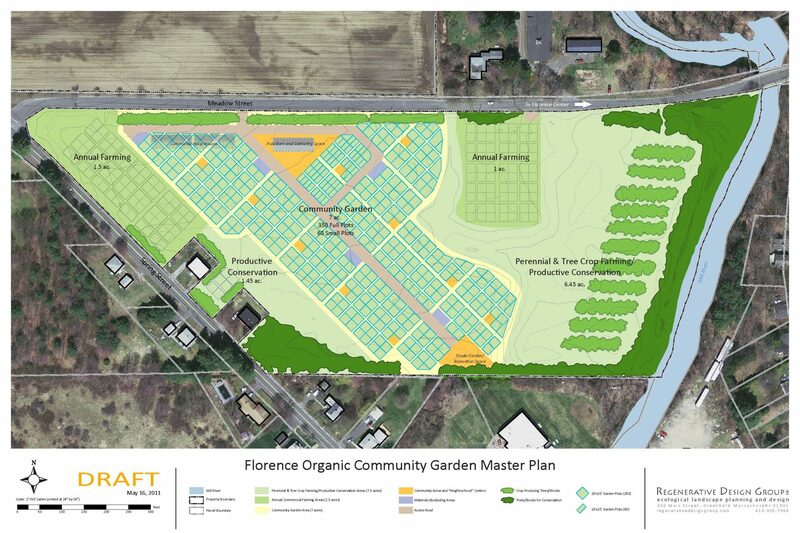 RDG has worked for many years with GFN, having designed their community garden site in 2011. 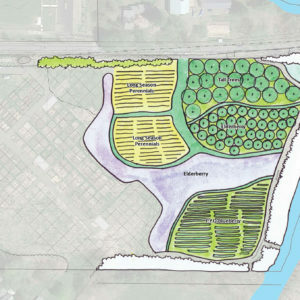 That original design focused on the layout, infrastructure, road buffers, and access needs that a 300-plot community garden requires. 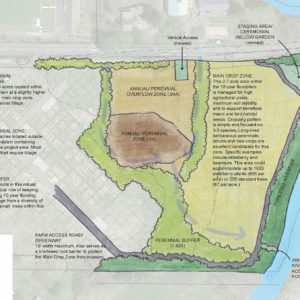 Included in the design, but not implemented, was a concept for several acres of productive conservation in the fragile riparian zone between the gardens and the Mill River. In Spring of 2017, RDG again joined forces with GFN to make that productive conservation vision a reality. 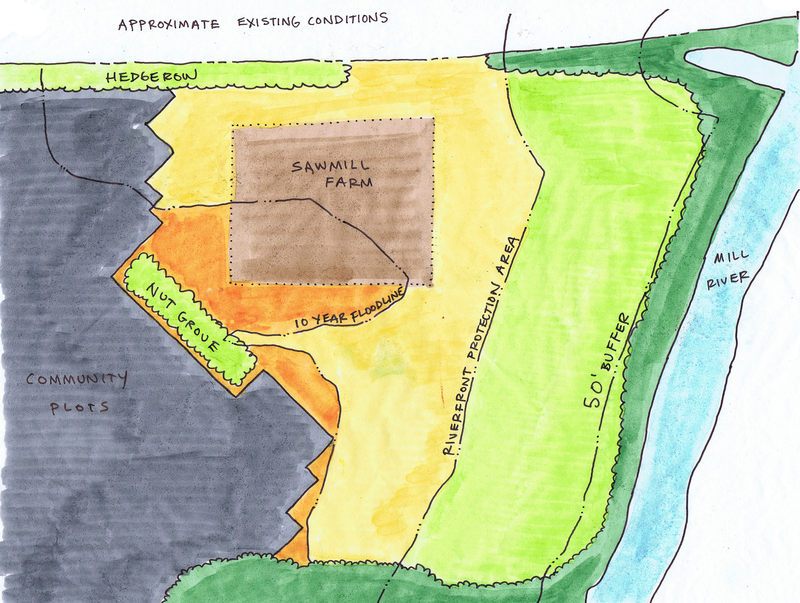 Parts of the seven-acre project area are vulnerable to erosion during periodic flooding events. 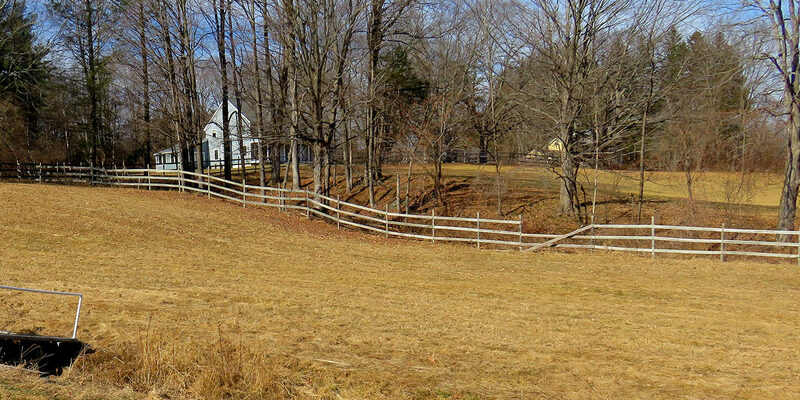 The last year of heavy flooding was during hurricane Irene in August of 2011, where floodwater was several inches deep on Meadow Street, and flowed south across the fields to rejoin the Mill River. 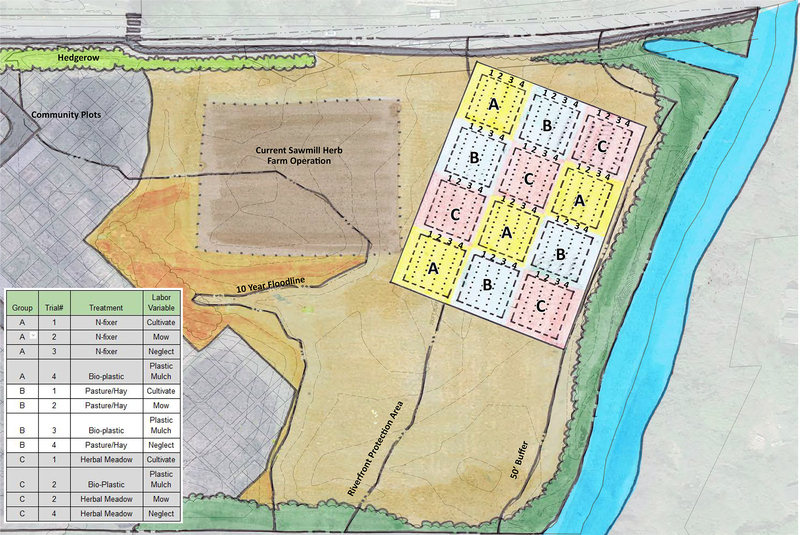 Bisecting the field is an imaginary line marking the Riverfront Protection Area. The boundary originates from the Massachusetts Rivers Protection Act (MRPA) of 1996, established to serve the following purposes: protection of water supply, groundwater, habitat, and fisheries; prevention of storm damage and pollution; and flood control. 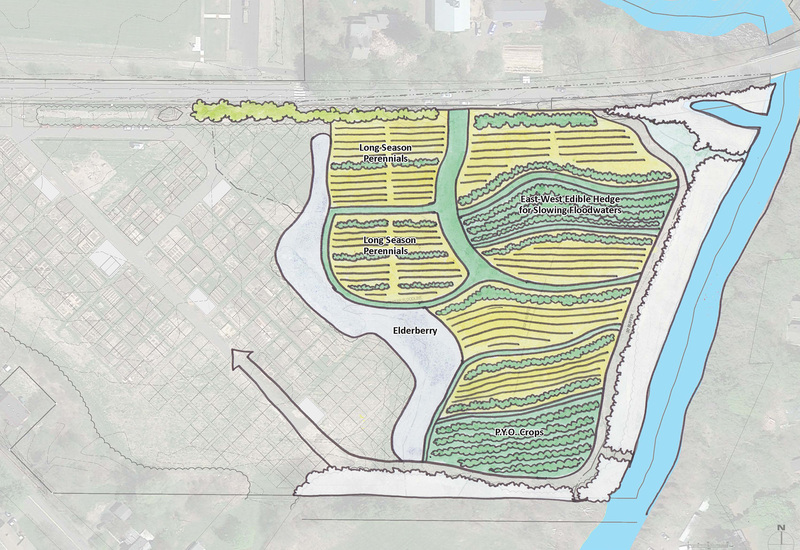 Currently, the Mill’s riparian buffer ranges from about 50 feet to less than 20 feet wide in some areas, far below the 200′ parameters of the MRPA. 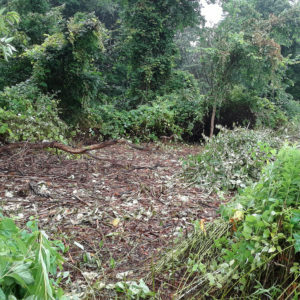 Additionally, the area is dominated by japanese knotweed, oriental bittersweet, and other non-native species. A thoughtful design and disciplined management during the first several years of implementation could result in a resilient, diverse, and profitable field – one that goes beyond the ideals of the Rivers Protection Act. 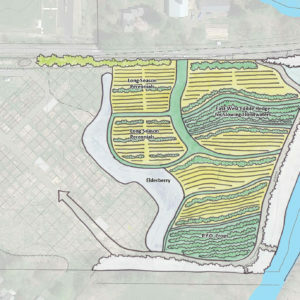 The big vision is that this pilot project would serve as a scalable model for farmers throughout the Mill River watershed and larger Connecticut River Valley. 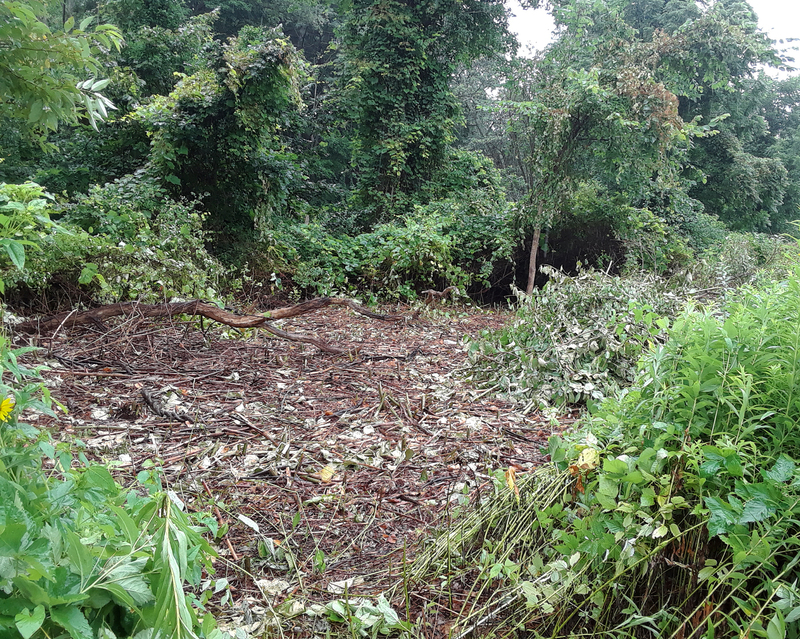 Forested Riverside Zone is a minimally productive restoration area, focused on invasive plant management. 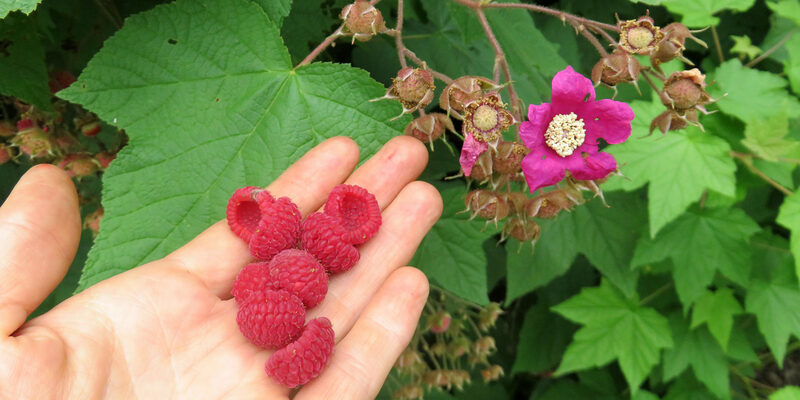 Some specialty crops like nut trees, fiddlehead ferns, and shade-loving medicinals are propagated. 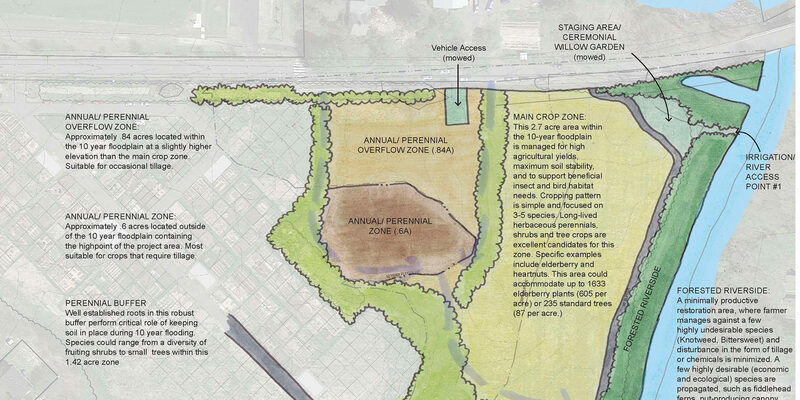 Main Crop Zone is 2.7 acres within the 10-year floodplain, managed for high agricultural yields, maximum soil stability, and beneficial habitat. 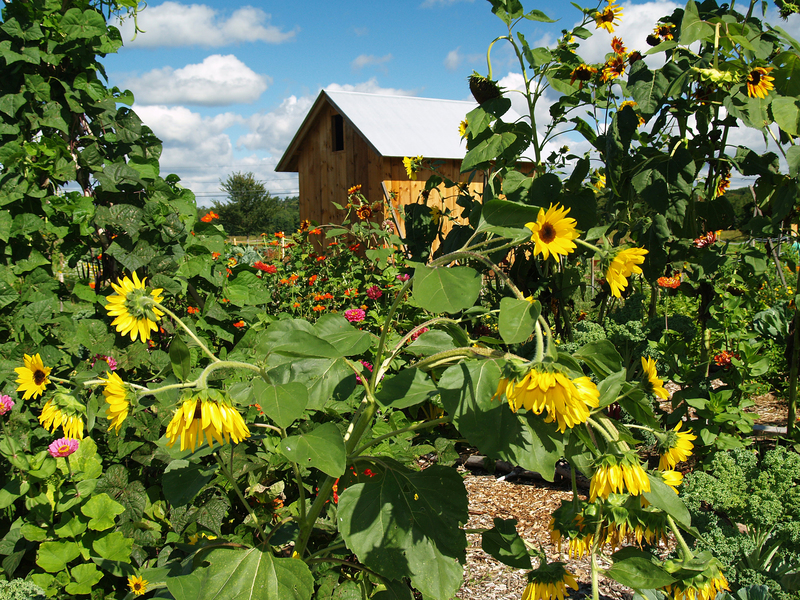 The cropping pattern is simple and focused on 3-5 species of tree, shrub, and herbaceous perennial crops. 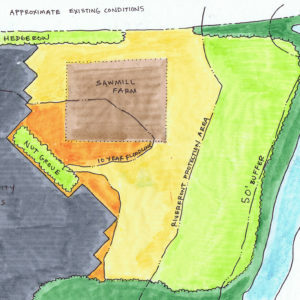 Perennial Buffer Zone is a secondary buffer that protects the community gardens from floodwaters while providing a functional hedgerow between the site’s activities. Annual/Perennial Tillage Zone, at a higher elevation than the main crop zone, withstands occasional tillage and allows for crop flexibility. Within this elemental framework, various concepts were generated, with elderberry as a common theme throughout. Elderberry’s ability to withstand periodic flooding, its’ thicket-forming character, and its’ promise as a diverse, value-added crop makes it a good candidate for field trials. 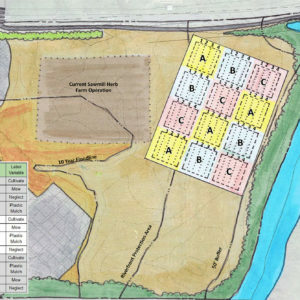 RDG has applied for two grants to support the study, trials, and further design of this project. We’ll provide periodic project updates as things progress. 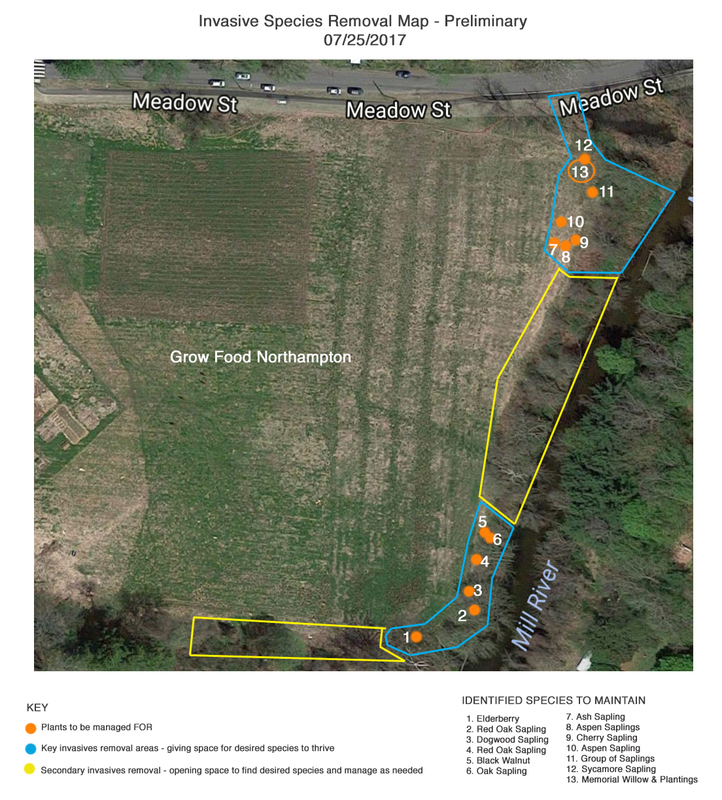 Enhance conservation value of the Northampton Community Farm, especially its riverfront and neighboring Mill River Greenway.